After a CoolSmooth procedure, the body naturally metabolizes destroyed fat celss, leaving you with a slimmer, sculpted body. Plus, unlike surgical procedures, most people are able to immediately return to their daily activities. Am I a good candidate for a CoolSmooth™? 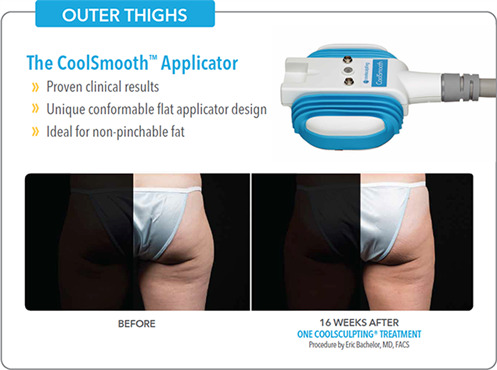 CoolSmooth™ treatments are resommended for people with an active lifestyle looking to banish stubborn areas of non-pinchable fat, such as the outer thighs or saddle bags and upper abdomen. Many of our patients choose to schedule this treatment after they've seen the results of an initial CoolSculpting® session. 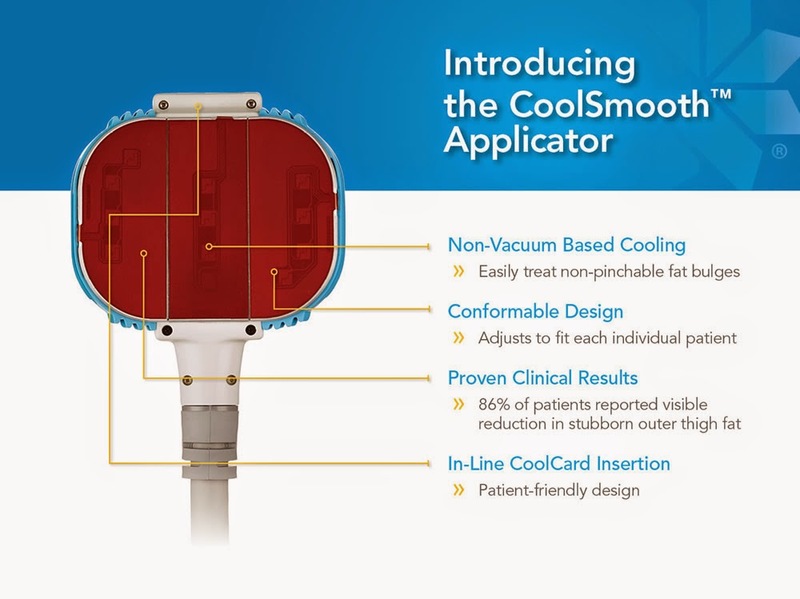 What happens during a CoolSmooth™ appointment? Eaach CoolSculpting® and CoolSmooth™ treatment begins with an initial consultation.First,we will discuss fat loss goals and expectations, and perform a 360 degree evaluation of your current physique Together, we will develop a treatment plan that will take you from your first Coosculpting treatment to a slimmer, smoother you. Before beginning the treatment, we'll take a moment to discuss your goals, and mark the probloem areas to be treated. Then, a protective gel pad is placed over the treatment area, and the applicator is put in place. MOst patients can immediately return to their daily activities after a CoolSmooth™ session. Whwn will I See CoolSmooth™ Results? After a CoolSmooth™ procedure, patients will see results begin to appear as the body metabolizes the fat from the treated area. Some patient may see results as early as 2 weeks! But the most dramatic changes happen from 1 to 3 months after a CoolSmooth™ procedure. With optimal maintenance and care, CoolSmooth™ results are peermanent. Wow! I had done the CoolSmooth treatment for my saddlebags last Jan and although it was a little uncomfortable , I am loving the results right now. Imy outer thighs are reduced significantly to look good in pants. Although a further reduction would make it even better, I am pretty satisfied with the outcome. For 20years I have been living with these thigh fats and wishing i could make it go. Wasn't keen on invasive procedures so the CoolSmooth was a God sent in a way. I am going to conduct my next 2 CoolSmooth session in April to further reduce my outer thigh fats and inner thighs as well. I want to have slimmer thigh and more "streamlined" thighs so I will look well groomed in my pants. So here goes. Will update what happens.